Colonizing is hard work! Relax with a rousing round of golf on the Mars back-nine! Can you land your specially-engineered golf ball between the rocky hazards on the wind-swept Martian plateau? Can you drive over treacherous terrain and sink your shot in fewer flicks than your opponents? 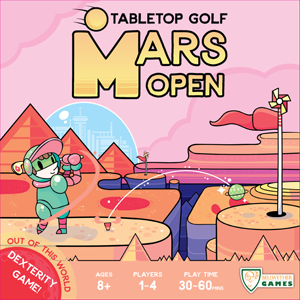 You'll be surprised how much golf on Mars plays like the classic Earth game, and with dozens of hole arrangements there is no shortage of exciting new challenges. Suit up, grab your clubs, and flick for a crater-hole-in-one!